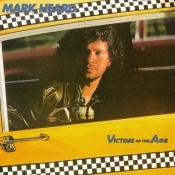 The city - with it's noisy streets, buildings, cars and neon lights, provides the major metaphor in Mark Heard's latest album, Victim of the Age (Home Sweet Home R2107). His 1981 release, Stop the Dominoes, revolved around issues of alienation and the loss of individuality. Victims takes on an equally serious problem in the church today: isolationism. Like Daniel Amos' Alarma, these nine songs confront the see-no-evil, hear-no-evil attitudes held by many present-day believers. Heard's word pictures are vivid and believable, from the "Faces In Cabs" (the anonymous souls Christ died to save) to the self-centered man portrayed in "Nothing is Bothering Me." With repeated listenings, larger themes seem to envelop all of the songs. One is of true compassion for the "masses out there." "Some Folks' World" presents a good view of this. (Remember, we're commanded not to judge unbelievers.) The other major theme would be best defined as re-establishing our primary call: to love with the love that is greater than any differences we possess. "Everybody Loves A Holy War" uses satire to make this point. Musically, Victims rings with the street-smart bravado of groups like Bruce Springsteen's E Street Band, along with some slap-back vocal techniques similar to those used by John Lennon with producer Phil Spector. I'll be honest with you: the sounds on this album do a lot for me. Heard's music always has, but this one's the best yet. Mark is becoming the consummate recording artist, producing and arranging as well as handling all guitar parts (this would be enough), some background vocals, co-engineering, and the final mixdown. Victims of the Age is a careful, mature, incisive challenge to believers to come out of hiding and love a dying world. "high exertive vocals...filigreed guitar growls...equaled by strong melodies"